Giovanni Bellini's Agony in the Garden exemplifies the artist's early painting style, in which he employs the use of techniques presumably taught to him by his brother-in-law, the Paduan artist Andrea Mantegna. All the while, however, Bellini's own preference for the careful use of light to convey emotion contributes to the artistry of the piece. Bellini has created a fairly well-balanced depiction of Jesus and his disciples in the garden. Although the human figures and propellers of this story only occupy three quadrants, Agony in the Garden achieves an excellent balance through the use of the diagonal, bottom left to top right, guiding the eye around the image. The main action of this painting lies along this diagonal, contributing to a balanced composition. The eye first lands of the most prominent subject - Jesus praying on the rock - and is then led from the Roman soldiers to the sleeping disciples, back to the anguished Jesus and finally to the angel in the sky and toward the lightening horizon. By doing this, Bellini deftly contributes to the overall meaning of this painting by leading those viewing it through the story of Jesus' betrayal, arrest, and eventual execution and resurrection. The landscape Bellini created to house his composition is also noteworthy, with its winding streams and roads, and craggy rocks. The drama of these features serves to heighten the overall emotion of the piece, mimicking the swirl of emotions brought about by the painful knowledge of his betrayal and his ultimate sacrifice that must be gripping the fervently praying man. Throughout his life, Bellini proved himself to be a truly skilled light-smith, exploiting beams and shadows in a way that provoked his two-dimensional figures into living three-dimensional beings. Bellini's Agony in the Garden, incorporates a rising sun in the background to shed light upon Jesus and his sleeping disciples. Traditionally, Jesus' arrest in Gethsemane was portrayed under the cover of darkness, or with perhaps only a glow of light seeping timidly from the horizon. Bellini's rendition, however, uses light to do what light does best - illuminate. 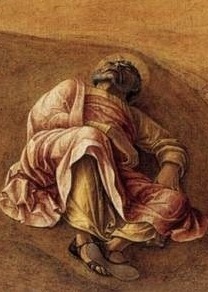 He illuminates the features of the anguished Christ and the sleeping disciples to convey detail and emotion. The light Bellini incorporates into this piece also seems to serve the larger purpose of conveying the promise of resurrection and eternal life for Jesus and his followers. The translucent angel in the lightening sky, sent by God to strengthen and comfort Jesus, is also one of the most illuminated figures in the painting, adding further strength to the notion that Bellini wants to express the hope beyond the agony. Bellini most likely painted this piece while under the influence of Mantegna, whose painting by the same name and nearly identical composition hangs on the wall next to Bellini's at London's National Gallery. Mantegna had been trained in the Paduan tradition of painting, with an emphasis on the structural strength of figures and dramatic foreshortening and perspective techniques. 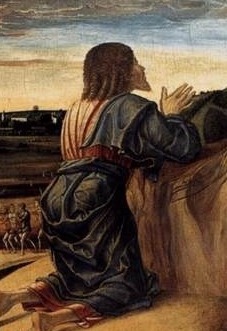 Mantegna and his techniques were a strong influence on Bellini's early career, and this is evident most notably through the severely foreshortened figure of the disciple John (closest to Jesus), and reliance on drawn contour lines. Later in his career, Bellini forwent the use of strong contour lines and adapted his paintings more to his own inclination to create softer, airier figures. 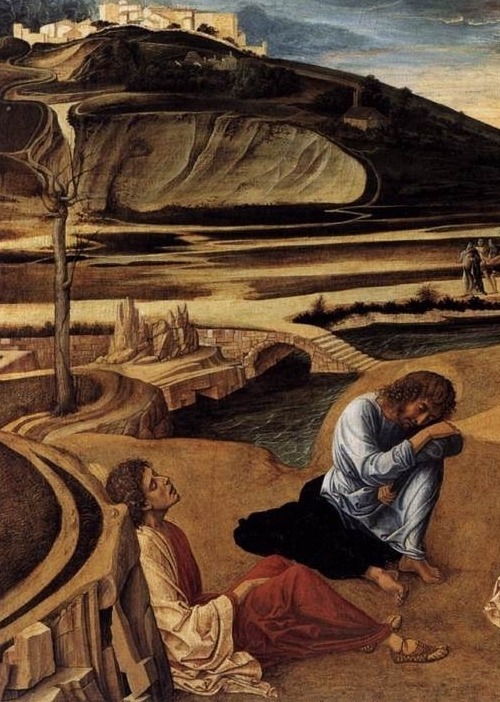 Bellini painted Agony in the Garden using the tempera paint method, which is comprised of pigment and a binding agent, such as egg. Tempera paints dried extremely quickly, making blending colors extremely difficult, but Bellini's desire to portray life-like and emotive figures clearly overcame this handicap and he was able to produce a work such as Agony in the Garden. Much of the tone and emotion of this painting is expressed through Jesus' posture and eager, Heaven-directed expression. Bellini rendered his countenance and expression with a careful attention to detail to allow an overwhelming feeling of sadness and concern to emit throughout the painting after a close look at Jesus' face. Further adding to the feelings of concern for Jesus' fate is the prominence of the slumbering disciples - who were supposed to have been praying with Jesus but were unable to remain awake - and the rapidly approaching religious leaders and guards brandishing their weapons. The left side of the painting, with the disciples and guards, contrasts somewhat with the relatively calm left side of the painting, which focuses on Jesus, the angel and the dawn. Although it is Jesus' expression that initiates the tone of the painting, that tone is only sustained through the angry mob and unobservant disciples. The right side of the painting, despite Jesus' torment, ties in the comforting angel and promising light of dawn. The light provided by the rising sun works to diffuse the sadness with the hope of eternal salvation.